The 27 hardy Americans that are permanent residents of Shemya Island are used to extreme weather. But they’ve never seen a storm like this before. Shemya—the “black pearl” of the Aleutian Islands—is a community that’s geographically much closer to Tokyo than Washington, D.C. (from which it’s nearly 5,000 miles away). The all-time record high temperature there is just 64 degrees Fahrenheit. 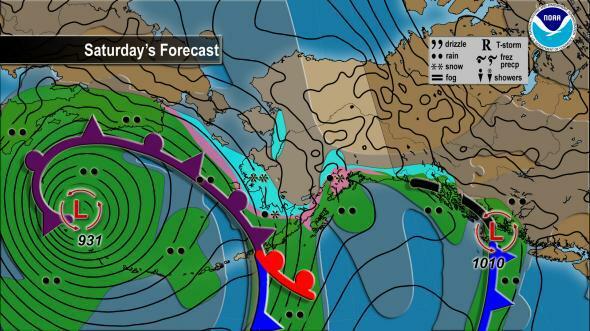 On Friday and Saturday, the Aleutians will take the brunt of a post-tropical cyclone, seeded earlier this week by Super Typhoon Nuri. By drawing energy from a particularly powerful polar jet stream, the storm will grow to become roughly the size of Alaska itself, packing wind gusts of up to 100 mph and waves 50 feet high. I don’t know about you, but it’s difficult to imagine myself on a 3-by-4-mile island like Shemya in a storm like that. 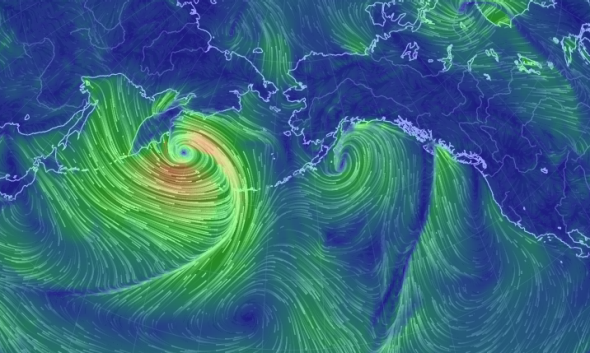 The “Bering Bomb” will grow to the size of Alaska on Saturday. Meteorologists refer to this sort of rapid deepening of extratropical storm systems as “bombogenesis,” after the colloquial definition of a meteorological “bomb”: a drop in central pressure of more than 24 millibars in 24 hours. Ex-Nuri will deepen as much as 50 millibars in the same timeframe—good enough for a “double bomb.” The central pressure of a storm is typically a good indicator of its intensity. The greater the difference between the storm’s central pressure and its surroundings, the stronger the winds. THE LOW WILL UNDERGO A PERIOD OF RAPID INTENSIFICATION. CURRENT FORECAST MODEL GUIDANCE SUGGESTS THE CENTRAL PRESSURE WITH THIS SYSTEM DROPS FROM AROUND 970 MB LATE THURSDAY NIGHT…TO BETWEEN 918 TO 922 MB LATE FRIDAY NIGHT. THIS WOULD CREATE A SIGNIFICANT EVENT AS THE CURRENT RECORD LOWEST PRESSURE OBSERVED IN THE BERING SEA IS 925 MB MEASURED AT DUTCH HARBOR ON OCTOBER 25 1977. Predicted sea heights from the Bering Sea storm are colossal—with each wave roughly the size of a prewar apartment building—though the storm itself will gradually fizzle out near the Arctic Circle over the next few days. But this storm’s legacy will linger across the continent. As I wrote earlier this week, the Alaska cyclone portends a major weather pattern shift across North America. 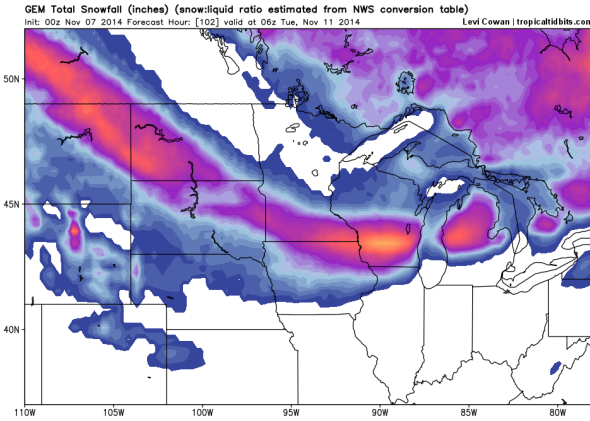 The latest weather models are increasingly certain that a swath of the Upper Midwest could see 6 to 10 inches of snow on Monday—an emphatic kickoff to a wintry week across much of the lower 48. 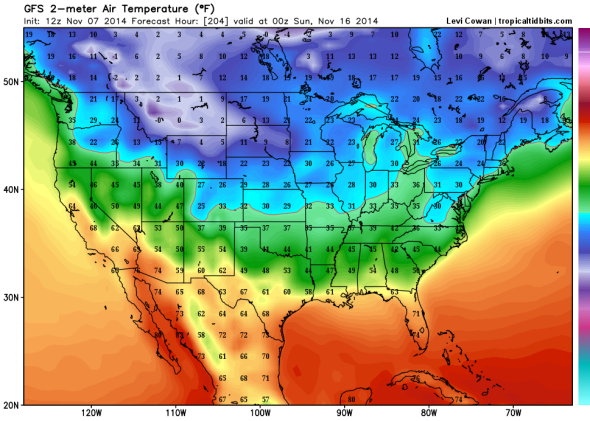 By next weekend, temperatures should drop below freezing as far south as Dallas, Nashville, and North Carolina. The first major snowstorm of the season looks increasingly likely in the Upper Midwest on Monday, with a foot or more possible in some places. High temperatures next Saturday should be more mid-January than mid-November.